Strep throat, tuberculosis, urinary tract infections (UTIs)… When your immune system isn’t in its top shape, you’re more prone to bacterial infections like these. For people with chronic illness, with compromised immunity, or for seniors – where aging alone means immunity isn’t as strong as it once was – these infections take hold more easily. That’s why natural remedies like certain foods and herbs known to help prevent bacterial infections are important to include in your diet. It’s a way to be proactive and protect yourself from getting sick. First, though, let’s distinguish between bacterial infections and viruses – which are commonly confused. The bacterial infections are caused by bacteria, while viral infections – like your typical cold – are caused by viruses. The most important distinction between the two is, antibiotic drugs usually kill bacteria, but they aren’t effective against viruses. You’ve likely heard about superbugs and antibiotic-resistant bacteria. Overprescription or inappropriate use of antibiotics is partly to blame for new strains of bacterial species that are resistant to medication. That’s why there’s a push to create superior drugs to combat bacterial infections and bacterial infection symptoms that can even be fatal. You want to do all that you can to protect yourself! Certain antibacterial foods and herbs offer natural remedies for bacterial infections to bolster your immune system and help you recover faster. Some are even reported to make antibiotics more effective, so if bacterial infection symptoms persist and you do require prescription medication, you could get back on your feet much more quickly. These particular foods, then, may help reduce antibiotic use. We’re all for going the natural route! Manuka honey: Top of our list! 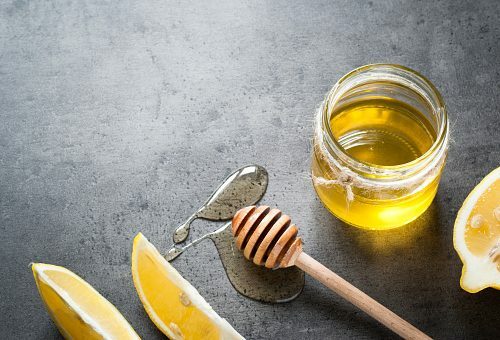 Honey has been used medicinally in ancient cultures for its healing antibacterial properties, but studies show there is a specific kind of honey that works best. It’s the manuka honey from New Zealand, harvested from the honeybees that pollinate the manuka bush. In research and development circles, in fact, manuka honey has been trademarked as “Medihoney,” which should give you some idea of its medicinal strength. Microbiologists from the University of Technology, Sydney, have found that manuka honey is superior for stopping bacterial infections in wounds. Results of their studies have been published in the journal PLOS ONE, demonstrating that manuka honey owes its antibacterial properties mainly to the presence of hydrogen peroxide and high levels of a chemical called methylglyoxalor MGO, not found in most honeys. The researchers found manuka honey, compared to other types of honey, was superior against four bacteria commonly found in chronic wounds. They tested the effect of New Zealand clover, manuka, and kanuka honeys on E. coli, Bacillus subtilis, Pseudomonas aeruginosa, and Staphylococcus aureus (MRSA). All manuka honeys are not created equal, however, so the less processed, more natural manuka is most effective. Maple syrup: Your favorite pancake topping could be helping your immune system. Researchers at McGill University in Montreal, Canada, tested a concentrated extract of maple syrup against infection-causing strains of bacteria, including E. coli in the laboratory. Study results concluded the extract was mildly effective at combatting the bacteria and “particularly effective” when applied with antibiotics. Interesting to note, researchers said they could see the maple syrup extract incorporated into capsule with antibiotics, helping to reduce antibiotics dose and use. Lemons: Add some fresh lemon to power up your water and your smoothies! The vitamin C content helps boost the immune system, for one, and helps the liver to dump toxins from the body by stimulating its natural enzymes. The sour, tangy fruit is a potent “cleanser” and recommended as a great start to your day to stimulate your digestion. Echinacea: A potent herb, popular for strengthening the immune system and warding off infection. The above part of the plant, rather than the root, is considered the most effective. It contains several chemicals that play a role in its therapeutic effects, including polysaccharides – substances known to trigger the activity of the immune system – and flavonoids. Mother Nature’s medicine is a great way to boost your immune system and give yourself a fighting chance against bacterial infection. Build these natural remedies for bacterial infections into your diet and see how great you feel. Bacteria are single-celled micro-organisms that live in different types of environment, both hot and cold. Some live in your intestines where they help to digest food, some fight disease-causing microbes, and some provide essential nutrients. There are a lot of good bacteria, but some can be harmful. Fewer than one percent of bacteria cause diseases in people, but when they do, bacterial infection symptoms can be hard to manage. The point is, infectious bacteria can make you very ill. What happens is, they reproduce quickly in the body and many give off chemicals that are toxic, damaging tissue and making you ill.
Also, infectious bacteria are easily contracted – whether you’ve touched infected bodily fluid, shared a beverage containing the infectious bacteria, have been bitten by an insect or animal carrying the bacteria, or inhailed bacterial particles emitted by coughing or sneezing. Then there’s indirect transmission, where you’ve touched bacteria on furniture, doorknobs, toys, personal care products previously touched by someone with a bacterial infection. In other words, it’s not surprising we get sick. But a strong immune system can ward off these invaders.